Darkest Night: Second Edition brings a unique fantasy world to your table through its story and theme. 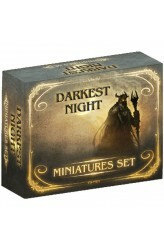 With the miniatures set, you can add some extra flair to your Darkest Night board game or use the Darkest Night characters with any of your other games. What's In The Box? : • 30 unique miniatures; one for each hero and one for the Necromancer .. 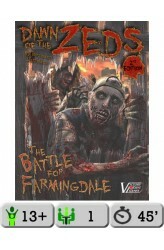 THE BATTLE FOR FARMINGDALE States of SiegeTM #9 Arising once again from the grave, from designer Hermann Luttmann and lavishly illustrated by Vinh Ha, arises Dawn of the Zeds Second Edition as you've never seen it before. 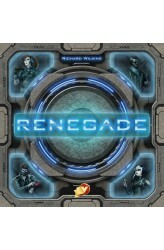 In this States of Siege™ solitaire game of horror and survival, your strategies will be put to the test. The world has gone crazy – a deadly virus has turned ordinary people into vicious, zombie-like killers. The undead, nicknamed "Zeds," are now converging on your corner of the world. You have been left to your own devices to stop them while the National Guard organizes a relief column and fights its way to you – but that could take days, or even weeks, before they arrive. At the town of Farmingdale and its surrounding villages, you must coordinate its def..
Jules Verne's classic novel Twenty Thousand Leagues Under the Sea tells the story of Captain Nemo and his astounding ship, the Nautilus. 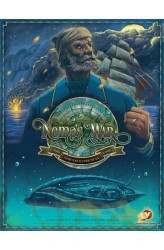 The second edition of Nemo's War, Victory Point Games' popular solitaire offering from designer Chris Taylor, is a greatly enhanced offering featuring mass-production printing and amazing Ian O'Toole art and graphics throughout. Set in year 1870, you set sail in this amazing electric-powered submarine, assuming the role and motive of Captain Nemo as you travel across the seas on missions of science, exploration, anti-Imperialism, and War! With this supercharged second edition of Nemo's War, prepare yourself for the adventure of a lifetime! https://www.youtube.com/watch?v=kjSpsma4iEk .. 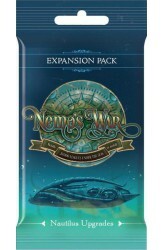 The Nautilus Upgrades Expansion Pack presents 12 new Nautilus Upgrade cards including the Clockwork Cipher, the Adventurer’s League, Nemo’s Manifesto, Prize Crew Quarters, and more! Sail aboard the Nautilus as you have never sailed with her before. ..
At the dawn of the SMC age, the people were losing faith in an increasingly amoral society. Mother was developed to emulate human thought and emotion, to simulate human desires and aspirations, to better understand the rapid decline in morality. The citizens of Sapporo became the guinea-pigs for this technological experiment. A series of city-wide neural implant programs, dubbed “the harvests”, enabled the gathering of data directly from a person’s cerebral cortex. Mother’s neural net became more and more empowered by the collective thoughts of a city of souls. She soon became her own master, not just reading the minds of her citizens, but controlling them. Mother was in charge and the people were now her automatons. Only a few, the few who from fear, mistrust or in protest, avo..